Ledgestone tournament director Nate Heinold has made a habit of releasing Limited Edition runs to support the tournament. The 2019 event will be no exception. Since the inception of the tournament’s relationship with Discraft, the tournament has released over 80,000 discs to support the event. 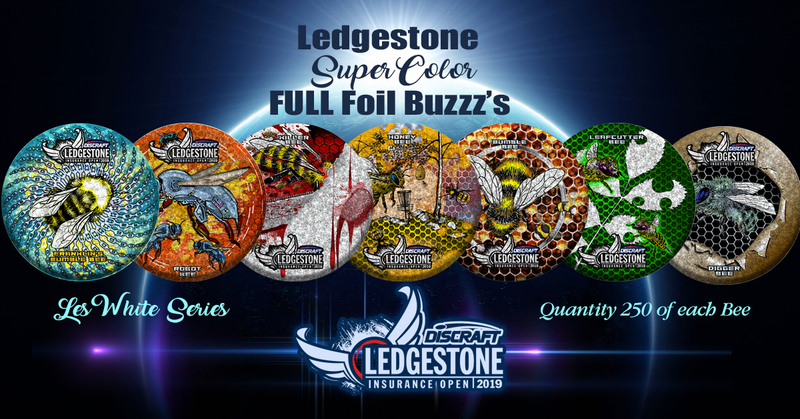 The tournament, in coordination with Discraft and designers Les White and Marnie Peters, are happy to announce the newest collectible item: The Ledgestone Super Color Full Foil Buzzz Collection. Nate essentially took the 7 Les White bees that were released in 2018 and commissioned in-house Discraft artist Marnie Peters to do a color design for each bee. Each design has a theme that relates back to the bee. In addition to the 7 bees from 2018, the tournament will also release 4 new bees for 2019 that will be released in December. With these 4 new bees will come 4 other super color/full foil designs for a total of 11 super color/full foil designs. Only 250 of each design will be created and released in the full foil plastic: 125 in the sparkle full foil and 125 in the prism full foil. Infinite Discs will be selling most of these, with a majority of the profits being donated to the tournament to support the 2019 event. “We are thrilled to continue to work with Infinite Discs for the event. Their support has been unmatched,” said Nate Heinold, Ledgestone TD. Demand for the discs is expected to be very strong, so keep an eye on the Ledgestone Insurance Open tournament page and Infinite Disc’s website for more information. Looks for these discs to be released next week on Infinite’s website. Next up in our ten questions series is Cale Leiviska, 2016 Ledgestone Runner-up. Cale was gracious enough to answer some questions on what he’s been up to and all things Ledgestone. Next up in our ten questions series is Ricky Wysocki, two time World Champion. Ricky was gracious enough to answer some questions regarding his switch to Innova Champion Discs and his thoughts on all things Ledgestone. We were able to catch up with Paul McBeth to get his take on Eureka and all things Ledgestone. Enjoy this in depth look into Paul’s thoughts in regards to one of the biggest tournaments of the year.